Anne McDonald from Signs of Art will be telling us about the large amounts of landfill and non-recyclable waste that is produced through modern sign production as opposed to traditionally painted signs. There will be a short demonstration that showcases the differences. 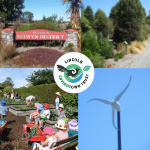 The talk starts at 7pm, followed by the Lincoln Envirotown Meeting which starts at approximately 8pm. Meetings are the first Monday of every month, excluding Public Holidays.